men-u Clay is great for matt, choppy, dishevelled styles. Long lasting flexi-control, texture and definition. 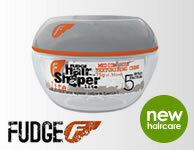 Great for beach, surfer look and difficult hair. Put small amount between palms and rub together. Work evenly and thoroughly into dry or towel dry hair. Mould pliable hair into required style.